John Michael McDonagh's feature debut, The Guard, opens with a scene in which a group of young men are seen drinking and driving around the back streets of County Galway whilst Rock Star by N.E.R.D. plays on the soundtrack. It's an exuberant, slightly obnoxious opening gambit that ends almost as soon as it begins. The car zooms past Gerry Boyle (Brendan Gleeson), a member of the local Garda (the Irish police force), only for it to crash off-screen, to Gerry's obvious annoyance. He gets out of his car, rummages through the pockets of the dead men, and finds drugs on one of them. If the obvious transgression of interfering with a crime scene wasn't evidence enough that Gerry isn't a conventional cop, the film makes this point very obvious when he takes the drugs and throws them away, but not before taking a tab of ecstacy for himself, so he can appreciate what a 'beautiful f**king day' it is. This short, economical opening beautifully establishes the character of Gerry Boyle as a man who is pretty much wholly corrupted, but not evil. Certainly, he takes drugs from a dead man, but mainly because he doesn't want the fuss and bother that would come about if anyone else found the drugs. He's world-weary, and wants things in his little parochial corner of the world to move along as smoothly as possible, even if he has to break the law to maintain the peace. Gerry's world is profoundly altered by the appearance of a new constable (Rory Keenan) and the discovery of what might be a serial killer acting in the area. 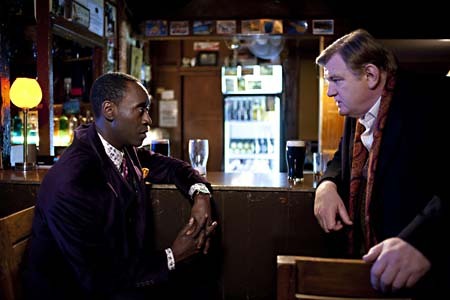 This quickly snowballs out of control, until Gerry is dealing with drug dealers, blackmail and an FBI agent (Don Cheadle) who believes that his skills and training have prepared him for dealing with some of Ireland's more colourful characters. The most obvious point of comparison for The Guard is In Bruges, which was written and directed by John Michael McDonagh's brother Martin McDonagh (who also serves as an executive producer on The Guard) and which also starred Brendan Gleeson as a man of dubious morality. It's also a wildly inaccurate point of comparison because, whilst the two films share a similarly curdled and caustic sense of humour - not least of all a similar glee in having their character say incredibly racist things for comic effect - they have little else in common in terms of style and tone. Whilst In Bruges was an attempt to do Harold Pinter with gags, The Guard is a police procedural with Western overtones, which distinguishes itself through a terrific sense of place and a wickedly intelligent, deadpan script. McDonagh's script is not especially plot heavy. There's no mystery about what is happening in Gerry's town because the film tells its story from both his perspective and those of the three drug smugglers (played by Liam Cunningham, David Wilmot and Mark Strong) who are intent on making their deal within his jurisdiction. The careful structure and pacing suggest that McDonagh doesn't consider the plot to be unimportant, but it serves largely as the framework upon which he can hang the various funny scenes and odd characters that populate the film. Each scene is very meticulously written, with funny, prurient dialogue flying from character to character at a bracing pace. Some of the lines occasionally feel awkward and over-written, but for the most part McDonagh's script walks a fine line between hard-boiled and empty stylisation. A large part of the reason why The Guard works so well is its cast of supporting actors, who help create its surprisingly well-defined world, even though many of them have only one or two scenes in the whole film. Characters like the local man who enjoys photographing crime scenes, for reasons best deemed unhealthy, the Gaelic speakers who refuse to talk to Wendell Everett (Cheadle) because he speaks English, and the member of the IRA who drives around in a bright orange Volkswagen Beetle and dresses like an extra from Dallas all have a bare minimum of screen time, but each of them is memorable and unique, and go a long way to letting us understand just how someone like Gerry Boyle can exist in this world and never suffer any consequences for abusing his power. Even though the supporting cast are very strong, the film belongs to Brendan Gleeson, who is typically great as Boyle. He plays him as a man who has seen a great deal and knows a lot, but doesn't let on that this is the case. Whenever he is confronted with authority, he acts like an ignorant small-town policeman who doesn't know better, but he is only hiding that he's a actually very shrewd and calculating operator, the only indicator of his intelligence being the ease with which he maintains his mask of stupidity. Or, to quote Everett, he's a man who is either "really motherf**king dumb, or really motherf**king smart." Gleeson's chemistry with Cheadle is also superb, with the two establishing an uneasy dynamic that never quite reaches the level of comfort that you would expect from these sort of fish out of water/mismatched partners stories, even when they are preparing to take the fight to the smugglers in the film's wonderfully executed climax. The Guard is a hugely entertaining film that is satisfying on a number of different levels. It works as both a pure genre exercise, but also as a sly comment on the standard tropes of that genre (best evidenced by a scene in which Mark Strong delivers an hilariously bitter tirade about bribery etiquette). It's a crass, raucous comedy that also finds time to reference Nietzeche, Bertrand Russell and to offer a critique of the entirety of Russian literature. Like its main character, it's a film with a lot of facets to it, all of which work together beautifully to make it one of the most purely fun films of the year.